Researchers from the Higher School of Economics (HSE) have developed a novel system for assessing the potential of renewable energy resources. This method can assess the future exploitable technical potential of wind and solar PV energy, as well as their capacity to replace existing energy generation assets. Furthermore, it can forecast fossil fuel savings and facilitate reductions in greenhouse gas emissions. Their research has been published in journal Energy: "Wind and Solar PV Technical Potentials: Measurement Methodology and Assessments for Russia." The study addresses the need for evidence and scientifically based, precise assessments of renewable energy potential, offering solutions to overcome the methodological limitations of previous country-level assessments (e.g., incomplete or unreliable sources, absence of hourly, daily and monthly assessments, etc.) based on the best available methods and data. The study was carried out by researchers at the HSE Energy Institute and Institute for Statistical Studies and Economics of Knowledge. Moreover, the paper also presents a detailed methodology for calculating renewable energy potentials that may be applied in any country or region in the world. Current assessment approaches usually feature three types of renewable energy potentials: gross (theoretical), technical, and economic. Moreover, the paper's authors introduce fuel potential (wind/solar energy potential in tonnes of reference fuel), heat energy potential (volume of heat energy in gigacalories and, consequently, heat energy savings gained through non-combustion of fossil fuels), electrical energy potential (volume of electrical energy in kWh, and, consequently, the savings of electrical energy that would otherwise be produced with the use of traditional methods), resource saving potential (savings of fossil fuels), and environmental potential (total air pollutants avoided). The suggested method for calculating renewable energy potentials clearly demonstrates the advantages of renewable energy. The main calculation was performed using the NASA SSE database. In order to assess the efficiency of wind turbines for various types of generating equipment, researchers from the HSE Energy Institute have come up with a new method, which, in turn, was validated through a comparative analysis of data obtained in the course of this study and data from a wind monitoring campaign carried out by a German engineering company in one of Russia's regions for a period of 18 months using 70-metre masts. This method allows the researchers, based on wind speed frequencies at a height of 50 meters above ground level, to calculate the Weibull probability density function at any height over the ground, along with the performance of wind turbines of varying capacities and height. For instance, the study proved that the highest potential for wind energy can be found in the territories of Russia's Far East, territories beyond the Polar Circle, and the coastal areas in the northeast of the country, as well as the Kamchatka Peninsula and Sakhalin Island. The best prospects for solar energy were found not only in Russia's southern regions. Certain regions in Western and Eastern Siberia also surpassed them in terms of solar irradiation and available space for solar stations. Substantial levels of cumulative solar irradiation have also been observed at the very northern territories of Russia—the Severnaya Zemlya and Novaya Zemlya archipelagos. In addition, the researchers assert that using the technical potential of solar PV and wind energy will allow Russia to save approximately 40 billion tonnes of coal equivalent of hydrocarbons every year, as well as prevent approximately 80 billion tonnes of greenhouse gas emissions in CO2 equivalent. The proposed methodology can be used in all areas of the world to support the advancement of renewable energy, thereby contributing to the implementation of the 2015 Paris Agreement. Renewable energy is beneficial, mainly for the fossil fuel industry. Southeast Asia is planning 400 new coal power plants, Germany is planning to build more 20 and Japan more 45 coal plants to keep lights on when sun is not shinning or wind is not blowing. "With the planned expansion, the death toll from coal in Southeast Asia would approach that of India, where coal-fired power plants are responsible for an estimated 100,000 deaths each year." They will need some transmission lines, since the population density is low in many areas with renewable potential. 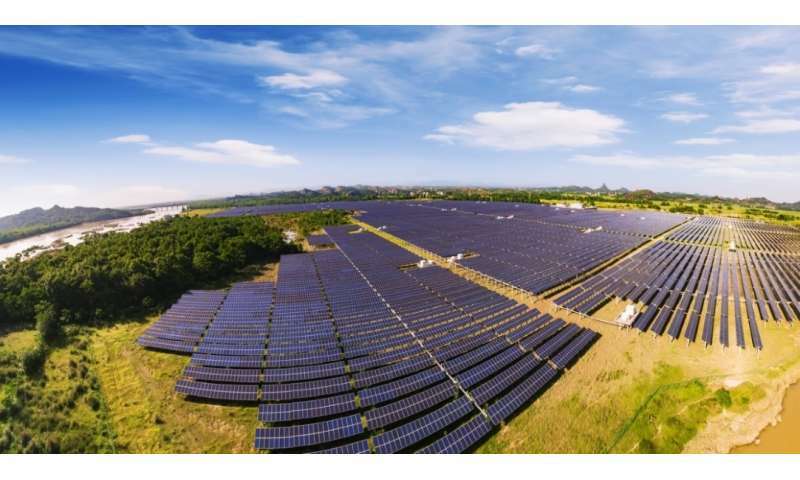 "The California Public Utilities Commission has unanimously approved an order that doubles the budget for the state's Self-Generation Incentive Program (SGIP) and directs the additional funding to energy storage projects. The PUC ordered that beginning in 2017 the state's three investor owned utilities shall collect $83 million on an annual basis through 2019 for SGIP. 85% percent of the $249 million in funding over three years is directed to fund energy storage projects, with the remaining 15% directed to renewable energy generation projects"